The 606158 Movado Museum Red Label Men’s Watch includes a number of features which set it apart from other Movado watches in terms of style and practicality. The 606158 Movado features a solid stainless steel case with a black dial that includes a single round hour marker at the top and an animated date display. The 606158 Movado Museum Red Label Men’s Watch is unique partly in that it uses a black alligator skin wristband. The solid stainless steel case has a very bold relative appearance both in its width—which is significantly greater than that of the strap—and in its metal attachments around which the ends of the strap hang. The dial maintains the simple aesthetic of the typical minimalist Movado watch face design except for the inclusion of the automatic date display curved into an inner ring around the dial center. 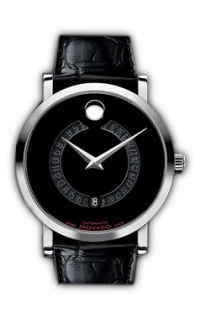 The 606158 Movado Museum Red Label Men’s Watch is a calendomatic watch which uses automatic Swiss movement. The 606158 Movado is built with a solid stainless steel case, scratch-resistant sapphire crystal and a crown with a water resistance of up to 30 meters. The 606158 uses a genuine black alligator wristband and includes a red Movado label on the bottom of the dial. The 606158 Movado Museum Red Label Men’s Watch retails at an MSRP of $1,795.00 and includes a 2-Year International Manufacturer’s Warranty at Purchase.